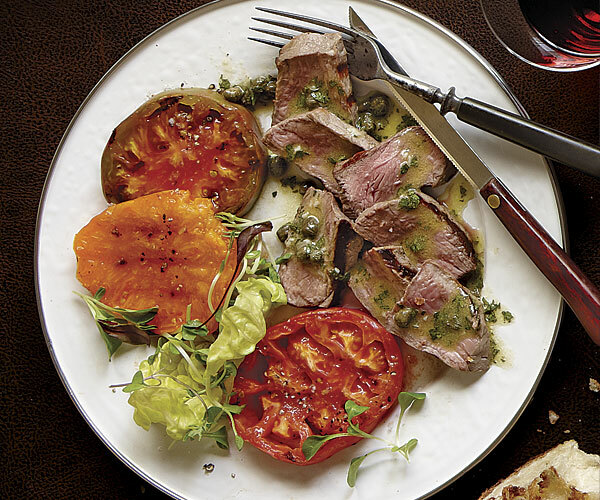 A bold and briny vinaigrette acts as both marinade and sauce for beefy grilled steak. Serve with garlic rubbed grilled bread and a green salad, if you like. If you can’t find Denver steak, substitute top sirloin or New York strip. In a small bowl, combine the vinegar, garlic, mustard, and anchovy paste. Slowly whisk in the oil. Put the steaks in a glass or ceramic dish large enough to hold them in a single layer. Reserve 1/4 cup of the vinaigrette and pour the rest evenly over the steaks. Cover and refrigerate for at least 2 and up to 24 hours. (Refrigerate the reserved marinade if not using within a few hours. Return to room temperature before using.) About 45 minutes before serving, remove the steaks from the refrigerator. Prepare a medium-high (400°F) gas or charcoal grill fire. Take the steaks out of the marinade, letting any excess drip off, and season with salt and pepper. Grill for 4 minutes, flip, and grill until medium rare (130°F), about 4 minutes more. Transfer to a cutting board to rest for 5 minutes. Meanwhile, season the tomato slices with salt and grill them on one side only until grill marks appear, about 3 minutes. Using a spatula, transfer them to a plate. Whisk the capers and parsley into the reserved vinaigrette. 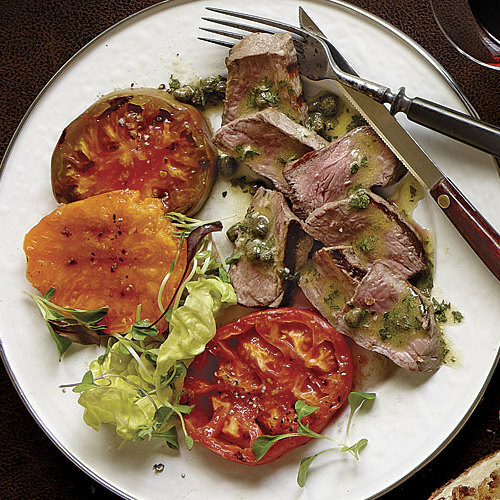 Cut the steaks across the grain into 1/2-inch-thick slices and serve with the tomatoes and the vinaigrette.